The Woody Guthrie Prize was awarded to everyman artist John Mellencamp during a program at the FlyLoft in the Tulsa Arts District on Thursday. Mellencamp was introduced as “Woody’s child” by Woody Guthrie Center Executive Director Deana McCloud. Wearing bib overalls and a white T-shirt as he walked on stage, he was greeted by a standing ovation and cheers from the sold-out audience. Mellencamp took a seat for a program moderated by handpicked music journalist Bill Flanagan. The crowd was treated not only to candid responses but to songs in an intimate setting. The Woody Guthrie Prize is given annually to an artist who best exemplifies the spirit and life work of Guthrie by speaking for the less fortunate through music, film, literature, dance or other art forms and serving as a positive force for social change in America. Past recipients include Norman Lear (2017), Kris Kristofferson (2016), Mavis Staples (2015) and Pete Seeger (2014). 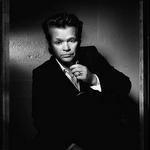 Mellencamp has championed the American farmer through his work with Farm Aid. Mellencamp said Farm Aid has helped a lot of people (but not all of them) who lost family farms and thought about killing themselves. He told a story about when he and Willie Nelson visited a Senate subcommittee about a farm bill that needed to be “talked up.” He said the first question they got was “Where are your guitars?” Mellencamp suggested to Nelson that they get the heck out of there. Instead, they did what they came to do, and so many lawmakers left that there were “maybe six guys” there at the end. The program was timed to coincide with the Friday opening of “Mellencamp,” an exhibit at the Woody Guthrie Center that was curated by the Rock & Roll Hall of Fame. Among those present at the program was Greg Harris, president and CEO of the Rock & Roll Hall of Fame. The Q&A session touched many bases, including politics and music. Mellencamp said he didn’t find out about his industry-prodded name change to John Cougar until he saw the name on an album. He also told a story about how he was determined to get out of a record deal after he heard an industry executive use a racial slur.